There are not many places on this planet, that I didn’t enjoy visiting a lot. But Dubrovnik’s old town is one of them. A backpacking trip to Dubrovnik is nothing, that I would necessarily recommend to individual travelers, that love to discover authentic places, to meet locals and to find hidden spots on a backpacking trip around Croatia. 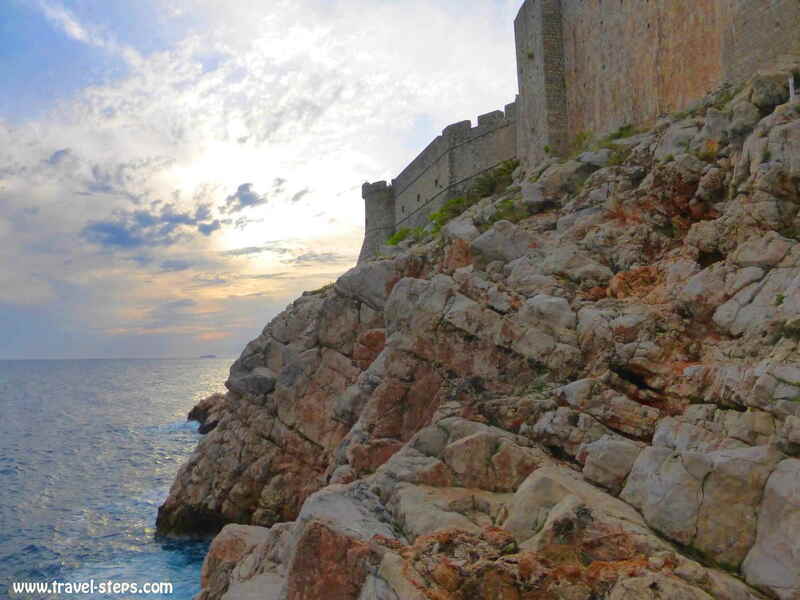 When I traveled to Dubrovnik, I had expected to arrive in a historical dream world. And it is true, that I saw interessting architecture in the old town of Dubrovnik. But I didn’t feel any magic or any spirit between hordes of cruise ship tourists and overpriced town wall sightseeing. In 2015, the old town basically felt like a museum full of hotels and overpriced restaurants. No idea, if real Croatian people were living in Dubrovnik’s old town. I didn’t see any of them. Probably, they were avoiding me and the millions of other tourists. I would have done the same. Maybe, that is sometimes the price, a city has to pay for being on the Unesco World Heritage List. 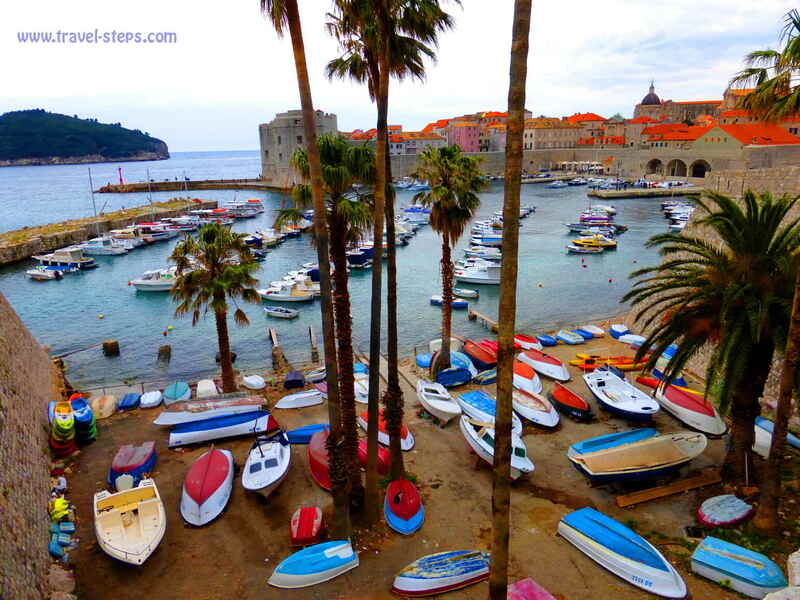 It was a windy and rainy day, when I arrived in Dubrovnik on my backpacking trip in April. I had taken the bus from Split. Dubrovnik was a further stop on my way backpacking around the Balkan states from Croatia to Montenegro and Albania. Split had been already quite touristy, but worth to explore the old town, the beaches and Marjan Hill. But Dubrovnik seemed to be a nightmare for individual tourists. I had been to Croatia 15 years before. Not to Dubrovnik, but I was traveling around the country during my student times. And it seemed as if the country had changed from a hidden gem into a extremely popular holiday hotspot. I knew that it had undergone changes, but I was still confused by how much it had changed. 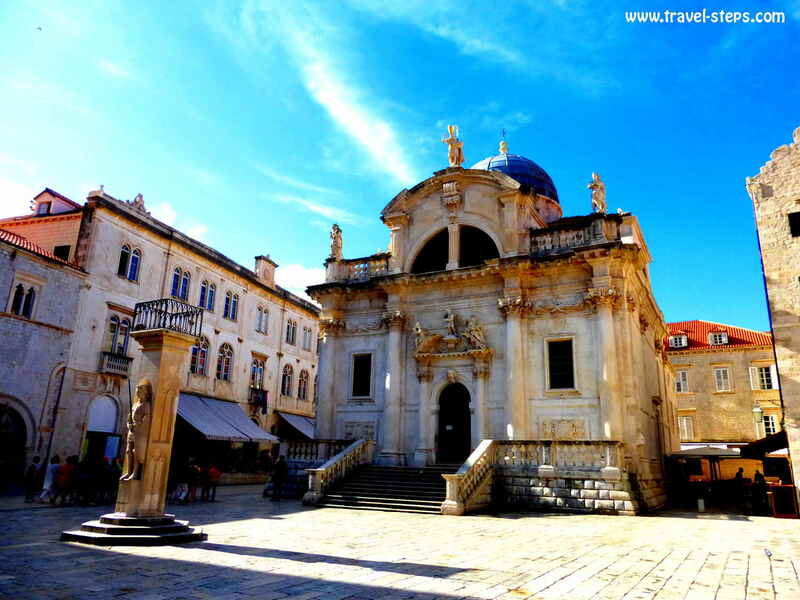 But don’t get me wrong: If you are in the right mood and well prepared to arrive in a tourist hotspot, there is still space to experience a brillant time in Dubrovnik, get some sun, take some pictures, stroll around the clean streets, have coffees or cold drinks, buy souvenirs and take it easy. 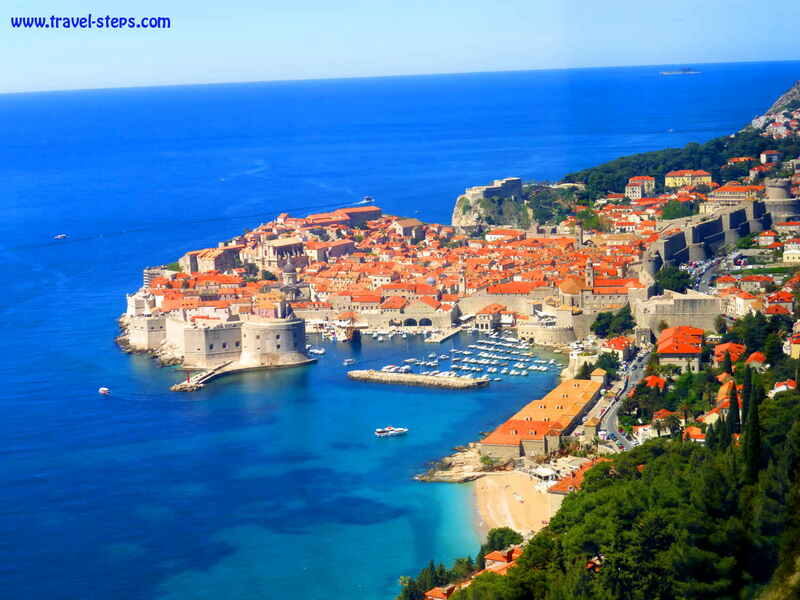 And Dubrovnik is definitely a place, that I can recommend to solo female travelers. During my whole backpacking trip around the Balkan states, I always felt safe and got treated respectfully as a female solo traveler. From the main long distance bus station, which is located two kilometers out of the old town center, I took a city bus to the old town, where I wanted to stay in a hostel. Staying in that hostel was probably the worst decision ever. Like this, I was trapped in the most expensive part of Croatia and wasn’t able to meet any Croatians. If I would go there again, I would definitely choose Air bnb or even couchsurfing to be able to discover the real Dubrovnic (probably outside the old city walls). I walked up the steep steps to my hostel. Steep steps were typical for some parts of Dubrovnik. Luckily, I wasn’t carrying a heavy suitcase like the South Korean girl shlepping herself up the hill next to me. The hostel staff was welcoming. The whole place felt clean and friendly. There was a nice terrace with a beautiful view on the old town, where I prepared my breakfast every morning. But when I saw the rooms with six beds or three bunk beds cramped in a 8 square meters, I first thought about a joke. But it wasn’t. The whole hostel was made for very small people. Even in the bathroom, it was difficult to turn around. It was not too expensive. In low season, I just paid 12 Euros for a bed, far less than in other places inside the city walls. But I was irritated by how you can make money. The good thing about it: My international room mates – all solo individual travelers from different continents – were really nice, so that we went out for dinner together already the same evening. There was no other chance than to get to know them on 8 square meters. And for sure, you didn’t want to spent too much time in the room. Luckily, I had just booked the accommodation for two nights. Already at dinner time, I realized the prices. We just went for a pizza and got a meal deal for around 10 Euros. I can have that a lot cheaper in Berlin, Madrid or Lisbon. Traditional Croatian food? I needed to look around hard for that. Some locals in the hostel recommended a seafood restaurant. But unfortunately I am not the type of person slurping down heaps of mussels. But I have to admit: You could for relatively small money. I really disliked the windy rainy place, that felt almost dead after the cruise ship tourists had vanished in the evenings. The waiters tried to catch the remaining tourists. I went back to my hostel, where some South Korean guests were cooking spicy noodles. Of course, the kitchen was as small as the rest of the hostel and the smell of garlic and spices didn’t find space to vanish. There were a lot of South Korean tourists of all ages around. 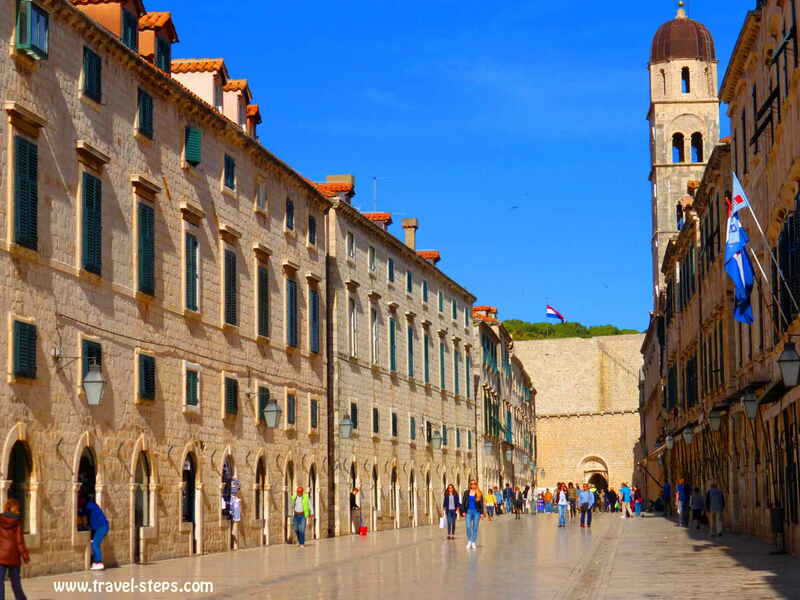 One girl, that shared her time and thoughts with me during my time in Dubrovnik, told me, that Dubrovnik was the place to be for South Korean travelers since they had shown a very popular soap opera on TV set in Croatia. And within the old town center, there was even a South Korean restaurant. But much more expensive than at home, she said. 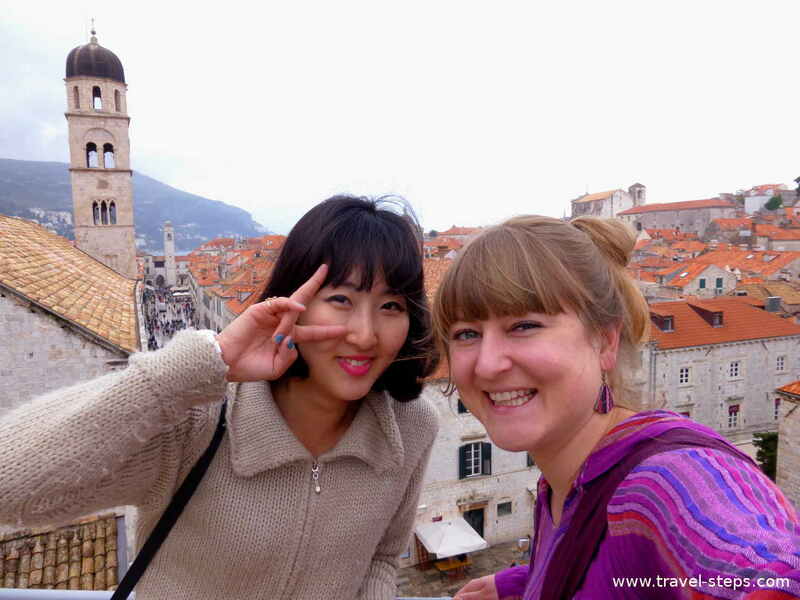 I learnt a lot about South Korean culture during my stay in Dubrovnik and I appreciated that a lot. The next morning, I wanted to walk around the old town on the 1,940 meters long city wall. 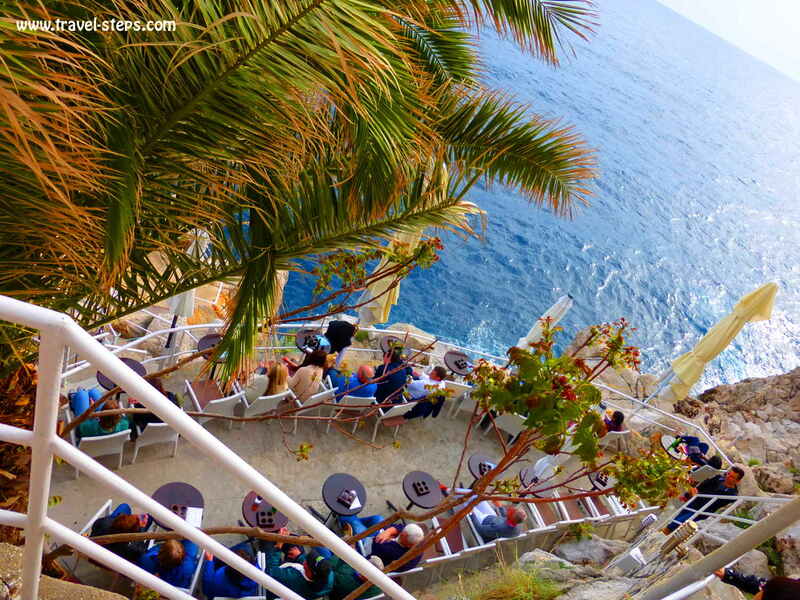 It is one of the things, that you have to do in Dubrovnik, even if it costs around 120 Kunas for an adult. The walk takes roughly two hours. Even if you are already pissed off by all the other tourists and tour groups, you have to do it. “You probably don’t want to come back to that place, so just tick it off your list.” That is what I told myself. And I didn’t regret it. There are really some beautiful views on the old town and the sea. I had discovered the old streets by walking around already. The walk around the old town offered a really new perspective and was really nice. It wasn’t even too full in April. As I said, it wasn’t the best weather. So I was busy taking pictures and watching tour groups brandishing selfie sticks. 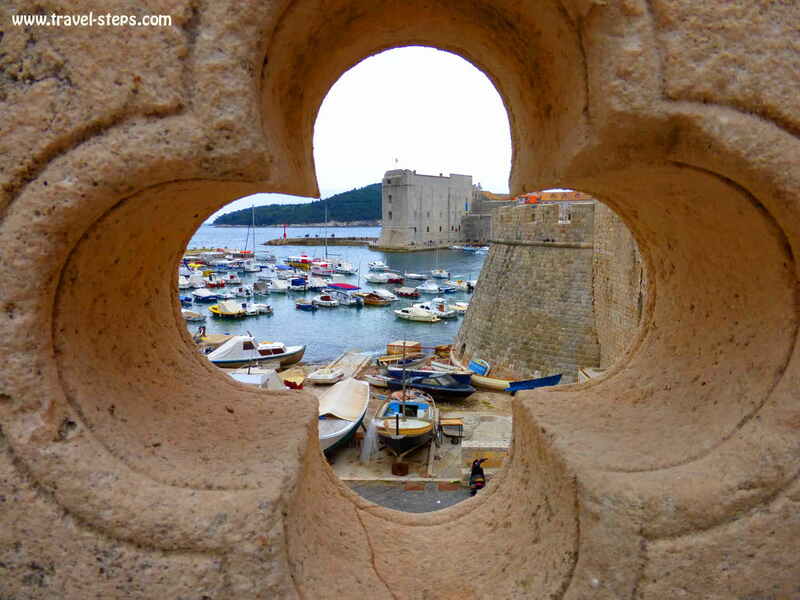 The ticket price also includes the entrance to the Lovrijenac Fortress, which is located next to the outer western walls of Dubrovnik and which offers great views on the old town. On the way, you are able to discover a few nice little swimming spots. Of course, there wasn’t all bad about Dubrovnik old town. When you are in that place, do it as the tourists do. 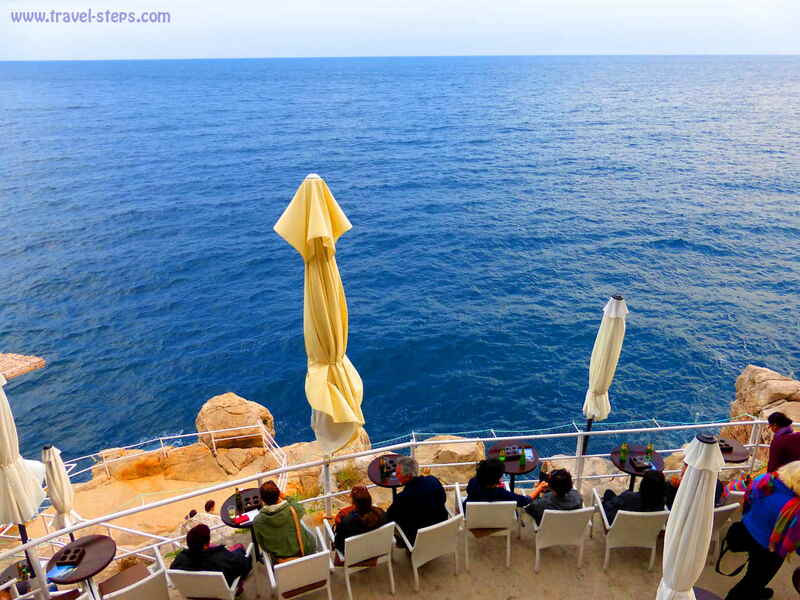 Don’t be ashamed having a drink in the ridiculous expensive Buza bar or Café Buza right at the city wall with a fantastic view on the sea. Just look for Buza beach on the city map and you will find it. The Buza Beach is nothing more than a few rocks. But the beach bar or “rock bar”-setting is beautiful. Going there to catch a bit of evening sun, was wonderful. But I had never sipped a drink for longer. The other nice place is the small beach right outside the city walls. It was really a place to be alone and to chill for a few minutes before walking up to the castles. It was far too cold for swimming, but not to enjoy the sun. If you are stuck in Dubrovnik for much longer without rain and fog, you can use your time to do some walks up the hills or even go with the cable car. Of course, it is not cheap with a return ticket for around 120 Kunas. From Dubrovnik, I took the bus to Kotor in Montenegro. It wasn’t a problem at all. There are several buses every day from the main long distance bus station taking officially just around 2 hours. The ride along the coast is great. Make sure to get a seat at the right side of the bus to get the full magic. I really didn’t want the bus to stop again, so I didn’t mind, that it took longer than 2 hours. And I was happy, that I had continued my backpacking trip to Montenegro.